The concept of impermanence is explored through depictions of the human body utilizing the fluidity of watercolour. Alice MacLean’s figurative paintings undergo a transformation on paper, allowing the watercolour to distort and obfuscate elements of the form, giving way to the subconscious. Drawing from everyday encounters with unknown people, Alice initiated the series first as miniatures, while exploring and walking around Paris as a student. The experience of being within another culture heightened her sense of alienation and her desire to connect with others. Observing others in public began an investigation into persona, and the idea of constructing a self. She began to portray singular individuals in a composition, and now works from found and personal photographs. After reading archetypal theories, she began to view herself and others as containing many similarities of shifting natures, instead of differences. 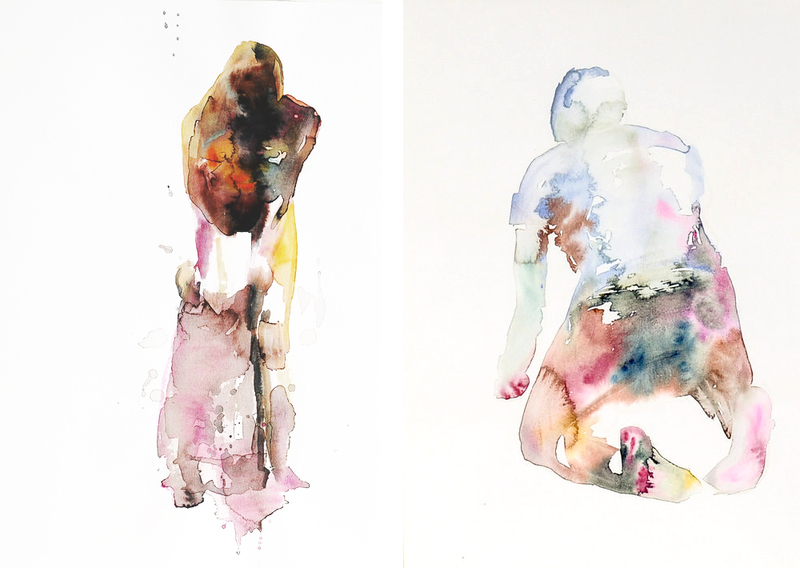 Alice’s watercolour paintings aim to document emotions through the use of colour and the human form, to reflect back to viewers their own inherent natures. The series Impermanence began as miniatures and expanded to larger formats with the intention of pushing the boundaries of watercolour through exploring new approaches. The large format requires a relinquishing of complete control over the material and process of development within each piece. The larger works further obfuscate and distort the forms, causing a tension between the desire to communicate realistically while allowing the unpredictable and spontaneous to occur. Fascinated by the concept of impermanence and finding meaning in conveying relatable experiences, her paintings portray the body as a field for transformation. Alice MacLean was born and raised in Dartmouth, Nova Scotia. She completed her BFA, with a concentration in painting at NSCAD University (2012). In 2011, she travelled to Paris to study at the Ecole Nationale des Beaux-Arts. Previous to studying Fine Art, she completed a Bachelor of Science with a major in Biology at Dalhousie University. This background provided a foundation of observational and investigative approaches to understanding the world, and developed an understanding of nature’s interconnectedness and the concept of impermanence. She had her first solo exhibition, The Imponderables, at the Anna Leonowens Gallery in Halifax, 2012. She has completed an Artist in Residency in Scotland (2013/14) where she gained exhibition opportunities in Edinburgh and Glasgow. Her works are included in residential and corporate collections in Europe and Canada. Alice was subsequently selected for the 2015/16 Visual Arts NS Mentorship Program. Most recently she completed a radiancy at Artscape Gibraltar Point (2016), on Toronto Island, which sparked a decisions to relocate. Alice now lives and works in Toronto, ON. She recently exhibited her watercolour painting at The Artist Project, 2017.